I got some new waders to replace my aging Redington Sonic Pro Zippered waders and took a few minutes to do a testimonial of my old Redington Waders and a video review of my new Redington HDZ Waders. I have the zippered version but the standard Redington Sonic Pro HD is also great. I was very happy with my old set and actually got over 2.5 years of guiding out of them! In fact, they were so reliable that I had a new pair that I had intended to start using but gave them to one of our younger guides that needed waders. I kept wearing my old ones and they never leaked. 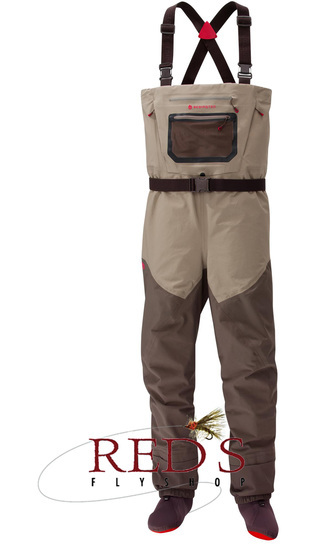 First off, these are $500 waders. They should and had better be very nice, durable, and reliable for that much money. I admit these aren't "cheap", so my expectations for this product are high. I don't let these companies off easy when they charge a premium price. There are lots of other waders that are likely a better 'value' for the casual angler. These waders are for folks that want to make a one time purchase, or only purchase waders every 5-10 years or so. 1. Breath-ability - I like the light feel and great breathability of the Redington Sonic Pro Waders. I like and have worn Simms as well, but these seem to breath better and I get less clammy. 2. Pocket Configuration - The pocket system on the new models is awesome. The cell phone pocket is a nice add on. I know you can buy this type of thing separately but I probably wouldn't and it clips to my waders so I quit losing stuff. The nice fleece lining on the hand warmer pockets is nicer than any wader I have personally used. 3. Reliability - I can count on these waders. They've never let me down. If you get cold feet and are worried about a pin hole leak ruining your fishing trip. Buck up and get the Simms G4. I personally trust these waders and in the event I was to get small leak, it won't bother me. Before I totally blow these waders out I thought it best to get a new set so that I have a reliable back up pair. The Redington HDZ is a great wader. Here is a video. 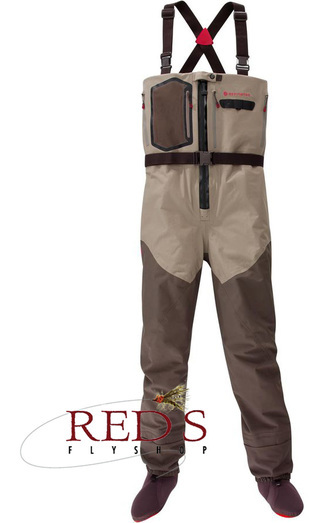 Redington Waders are covered by a one-year warranty against defects in material and workmanship. Any claim against this warranty must include a dated proof of purchase. This warranty is limited to repair or replacement of the product only, and does not cover direct, indirect, consequential, incidental or any other type of damage resulting from the use of the product. This warranty does not cover misuse, neglect, normal wear, fire, theft, loss, or intentional damage. Some states do not allow the exclusion or limitation of incidental or consequential damages, so the above limitation or exclusion may not apply to you. This warranty gives you specific legal rights, and you may also have other rights that vary from state to state. Redington reserves the right to replace any discontinued models with the newer models when necessary. In order to invoke this warranty, the original owner must send the entire Redington product, freight paid and insured to the Bainbridge Island address listed below. Weve updated the fit for this series to create a very refined fit for all available sizes. The Sonic-Pro HDZ Zip wader features a TIZIP center front zipper for superior durability when wading deep and ease of use when nature calls.